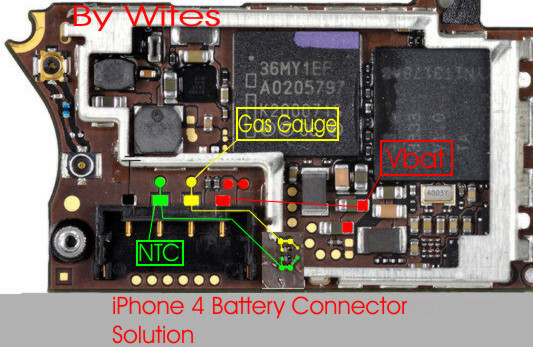 Why my iPhone 4 is not charging? Since, then, when the phone is plugged, it indicated that it is plugged, but the battery doesn't charge, as shown on the second picture. I put a wire between the pin n#2 of the battery connector and the 3rd component, but it is still the same. The phone simply acts as if the second pin of the battery was not connected at all. I tested the fuse but they are fine. I even shunted the USB power IC but the result is still the same. (these components are presented on picture 3). I made an experiment. I removed the 240-OHM-0.2A-0.8-OHM inductor on another working iphone. I put a wire from the 2nd pin of the battery to the 2nd solder point of the inductor (starting from the left), and the result is the same : iphone not charging. It means that the first solder point is essential to make it work. The problem is : this solder point was removed by the guy who made this bad work before and removed this component. So the question is : where should I connect the second pin of the battery connector to make the phone charging, knowing that I cannot connect it to the solder point of the inductor ? Picture 4 is presenting the removed component on the working phone. We can see that the two solder points are in perfect conditions, and I managed to put back the component after. I finally managed to take some acceptable pictures of the damaged area on the phone. On picture 5 is the damaged area after cleaning. I made a solder between this tiny piece of copper and the other point, but the phone is still not charging. To be clear with this last picture, the wire goes to the second pin of the battery, and the blue tape is to avoid any contact with the ground of the battery. It is the one with two red dots on it. The two red dots do not mark a component, but are testpoints. I mean the two green dots, sorry. I'm going to guess that the NTC line isn't the problem if the phone will boot okay and just not charge. I think if you have continuity between pin 2 and C12_RF you're okay. I would focus on the area around the dock connector--check for a burned or shorted component and consider replacing the charge protection ic or the charging coil. I already shorted charge protection IC. Where is the charging coil ? I like your experiment that you described above---can you show a clear picture of the actual damaged area? If the solder pad is gone, then you may be able to find its trace by lightly scratching the area around in order to expose enough copper to rebuild a pad out of thin wire. I reshaped all my text and added some pictures. I hope someone will be able to help me. A few days ago,My phone is not charging, Then I upgraded the system. It is already the last version and it has already been restored after the problem occurred. As I explained, the problem is hardware, not software. This topic is from march and we are in September... First, I really doubt this connector has anything to with the problem, if you know how to read. Second, I'm in France and I was looking for a bit of help, not someone to do it for me. And third, I gave back the phone to the client 6 months ago. You're right, Randy's answer really should have been posted as a separate unrelated question, and my comment as an answer to that question. I will mark it as such. Did you ever figure anything more out on this phone? I have a similar problem on a 4S no charging. There is no defect at the battery connector, but the phone is still showing fake charging despite the same work you've done here to troubleshoot. Pegston39 가/이 대단히 고마워 할 것입니다.